It had been in continuous production since 1936, and was only phased out because the 1267 cc Standard Special engine was itself being discontinued in 1949. The Plus Four was, essentially, the Series 1 with a 2138 cc Triumph engine in place of the Standard Special unit. 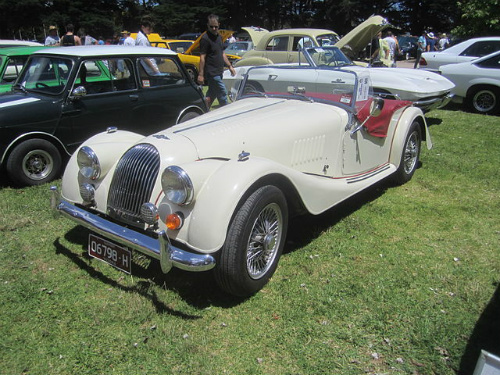 However, just over four years later, in 1955, the 4/4 was reintroduced as the two seater Morgan 4/4 Series 2. It was a somewhat basic model, powered by a 1.2 litre, Ford 100E side valve engine, as used in the Ford Anglia and Prefect saloons, linked to a rather ancient Ford three speed gearbox, not at all suitable for such a car. It looked and drove much like the Series 1, and retained the sloping grille, the elementary weather protection, and the hard ride due to the stiffened front coil springs. The Ford engine developed 36 bhp and a torque of 54 ft/lbs, had a compression ratio of 7:1, and used a single Solex carburettor. Although the front suspension retained the rather outdated sliding pillar system, it had now been fitted with rack and pinion steering. According to Morgan, the introduction of the Series 2 was to provide a sporty convertible for the enthusiast with limited means. The body styling was much like that of the Plus Four, the only difference being that the body was lower and simpler, with a sloping rear that housed a single spare wheel in a recessed compartment, unlike the two spares of the Series 1. Although it looked similar to its predecessor, the 4-4, it now utilised the same chassis as that used in the Plus Four. The Series 2 was produced between 1955 and 1960, in which time 387 units were built. In order to make up for the shortcomings in terms of performance, in 1957, the 4/4 Series 2 Competition model was introduced. This featured an Aquaplane aluminium cylinder head linked to two SU carburettors, and developed 40 bhp. Between 1957 and 1960, when production ended, 38 units of the Series 2 Competition model were built, consisting of 37 two seater variants, and one experimental four seater version. A 1957 Morgan 4/4 Series 2 in excellent condition following a full restoration was suitably priced at £25,000/$40,000.